After a complete 15 years of hard work and continuous development, an Israeli technology company is totally hopeful of bringing a new Flying car into this market of enthusiasm. This 1,500 kg (1.5 tonne) passenger carrying drone which has been named as “Cormorant” will be ready to be marketed by 2020. 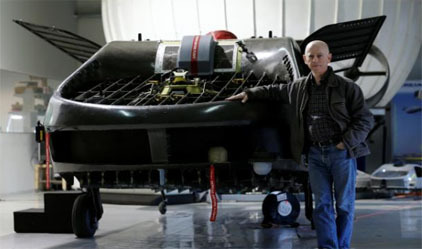 The Cormorant which was earlier named as Air Mule, is actually an unmanned air. This Flying car which is somewhat around the size of a passenger car was developed by Yavne, Israel-based Urban Aeronautics. Urban Aero has developed advanced aeronautics technologies that stands at the middle of the family of internal rotor aircrafts. The Cormorant is an advanced and patented VTOL (vertical take-off and landing) UAV developed by Urban Aeronautics. It has been designed keeping in view the dark green drone for which it has been enabled with internal lift rotors that enable it to fly inside woody, borough, steep and mountainous terrain where even the Helicopters fail because of inefficient Helicopter propellers which makes them enable to operate. The Cormorant, build and designed as a flying car, will be capable of transporting 500kg of weight and would travel at a pace of 185 km (115 miles) per hour. It completed its first automated solo flight over terrain in November. Its total price is estimated at $14 million. Yoeli set up this Yavne (central Israel) based company in 2001, to create the drone, which he considers to be safer than a helicopter as it can fly in between buildings and below power lines without the risk of blade strikes. Yet there are a few things left to be done on the Cormorant before this autonomous vehicle finally hits the market. One of the most important of all those are- It will have to meet all Federal Aviation Administration (FAA) requirements, since the first test flight in November 2016 reported some small issues with conflicting data sent back from the onboard sensors. The Cormorant has 39 patents registered to create the vehicle, and Yoeli says he is not at all concerned about competitors usurping his design. And perhaps more important, one industry expert says the technology could save lives. “It could revolutionize several aspects of warfare, including the medical evacuation of soldiers on the battlefield,” said Tal Inbar, head of the UAV research center at Israel’s Fisher Institute for Air and Space Strategic Studies.